Cashew Chicken, from Thyme for Cooking's Weekly Menu Planner. Stir-fries are always welcome when the season starts getting a bit hectic. 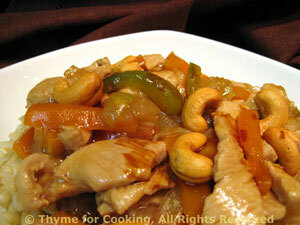 A simple stir-fry of chicken and vegetables made special with the addition of a handful of cashews sprinkled on top. Cook rice in stock / according to package instructions. Cut the onion in half, then in half the other way and slice - so you have 'quarter circle' slices. Cut the pepper and the carrots into sticks 1/4 inch by 2 inch. Add celery, onion, pepper, carrot and stir fry 3 minutes. Add garlic and stir-fry 1 minute more. Return the vegetables to the pan and add the chicken stock and sherry. Mound the rice onto a platter. Spoon chicken and vegetables on top. Sprinkle with cashews and serve.